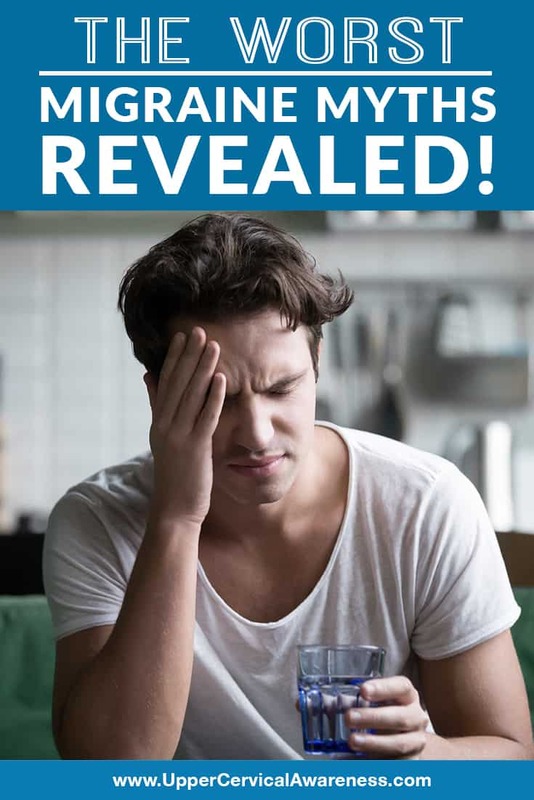 The Worst Migraine Myths Revealed! Home/Migraines / Headaches/The Worst Migraine Myths Revealed! Truth is your ally when you are battling a chronic ailment like migraines. Unfortunately, there are tons of myths surrounding this shockingly common neurological disorder. If you are one of the 39 million Americans suffering from migraines (or you know someone who is), then these are things you need to know. This is the worst myth and probably the one that creates the most stigma around migraines. I mean, who calls in sick to work for a headache, right? But migraines are not headaches. They are a neurological condition. That puts it in the same category as diseases like Parkinson’s and multiple sclerosis (MS). Headaches are just one of the many symptoms of migraines. The cause of migraines is considered to be unknown at this time. There are many things that trigger a migraine, and you may be able to avoid some of them, but this poses a few issues. First of all, different things trigger migraines for different patients. It may take months of recording events in a journal to ascertain what your triggers are. Second, you can’t avoid every type of trigger since many are environmental in nature or are related to the actions of others. Actually, the opposite may be true. Taking over-the-counter headache medicine too frequently can cause rebound headaches and make a migraine issue worse. Always use over-the-counter medications and prescriptions as directed. Don’t let a doctor prescribe opioids for your migraines. They provide little relief, don’t address the underlying problem (only one symptom), and they can lead to dependency. There’s no secret migraine cure diet. There isn’t even much research to back up the idea that certain foods are triggers. In fact, food cravings may be a symptom of migraine prodrome, so the reason you get a migraine after certain foods may have less to do with what you are eating and more to do with a migraine already revving up. That having been said, a healthy diet never hurt anyone. Cutting out fast foods and processed foods as well as artificial sweeteners and reducing refined sugar intake may help you feel better in general. Plus, cutting out any foods that you are sensitive to is also important. Maybe a person’s cause of death will never be ruled as migraines but consider this. Migraines and depression are associated conditions. Getting migraines makes it more likely that you will also suffer from depression. Americans who get migraines with aura are three times as likely to commit suicide, and the rate is up for all migraineurs. In another study, migraine patients under age 30 had a 40% increase in suicide risk. So while migraines themselves may not kill anyone, this is still a serious condition that can lead to premature death. If you suffer from migraines, take any indications of depression or suicidal thoughts seriously and get help. You’re not alone! Actually, an Italian study proves otherwise. In the study, they examined patients who had diagnosed themselves with cervical pain syndrome due to neck pain that started in the back of the neck, was triggered by weather changes, and that led to other symptoms such as vertigo and nausea. What they discovered was that 90% of the patients were actually experiencing migraines. According to some researchers, neck pain is one of the most common migraine symptoms, with 75% of patients experiencing neck pain either before or during the headache phase. It is important to note that neck pain and other symptoms can occur without a headache in 10-15% of migraines (another factor that differentiates migraines from headaches). Pharmaceutical companies try to push this myth in order to get their share of the billions that Americans spend on migraine healthcare each year. However, dozens of cases studies show that migraines can be significantly reduced or even eliminated by means of upper cervical chiropractic care. Why does this subspecialty of chiropractic help? The top bone in the neck is called the atlas. This is because it balances the head. Even the slightest misalignment leads to changes in the spine and surrounding structures in order to maintain proper balance of the head. Therefore, precise alignment is critical. The atlas also surrounds the brainstem. Thus, tiny misalignments can affect the body’s ability to send signals properly. You can see why this would play a role in a neurological condition such as migraines. Add this to the fact that the cervical spine facilitates blood flow to the head. Misalignments can keep the brain from getting the oxygen it needs to function properly. Finally, a misalignment can keep cerebrospinal fluid from draining properly. This, in turn, can lead to pooling and increase intracranial pressure. All of these things are factors in the occurrence of migraines and the many symptoms that can accompany the headache phase. This is also reasonable when you factor in how common neck pain is for migraineurs. It just makes sense to see an upper cervical chiropractor if you are dealing with migraines. This safe and gentle form of chiropractic may be just what you need to get your condition under control. To learn more, schedule a consultation with a practitioner in your area. Dr. Hanley2019-02-04T04:12:43+00:00February 3rd, 2019|Migraines / Headaches|Comments Off on The Worst Migraine Myths Revealed!